Home › Dorchester/Boston › This is a democracy. Whoever gets the most votes wins… right? This is a democracy. Whoever gets the most votes wins… right? Here we are, one day after primary elections in Massachusetts, and we see that whoever got the most votes in each race won. Right? Well, it’s not so simple. In the first place, one tenet of democracy is majority rule, but there are all kinds of counterexamples to that. For instance, consider the 14th Suffolk district for the State House of Representatives. Incumbent Angelo Scaccia won with 39.6% of the vote, far from a majority. More significantly, progressive challengers Gretchen Van Ness and Segun Idowu received 26.3% and 21.6% respectively, thus earning more votes collectively that Scaccia. (Two minor candidates also complicated the tallies.) If we had a two-round runoff system or an single-round transferrable vote system, this unfairness wouldn’t exist. We discuss all this at length in our Quantitative Reasoning class for rising sophomores at the Crimson Summer Academy. 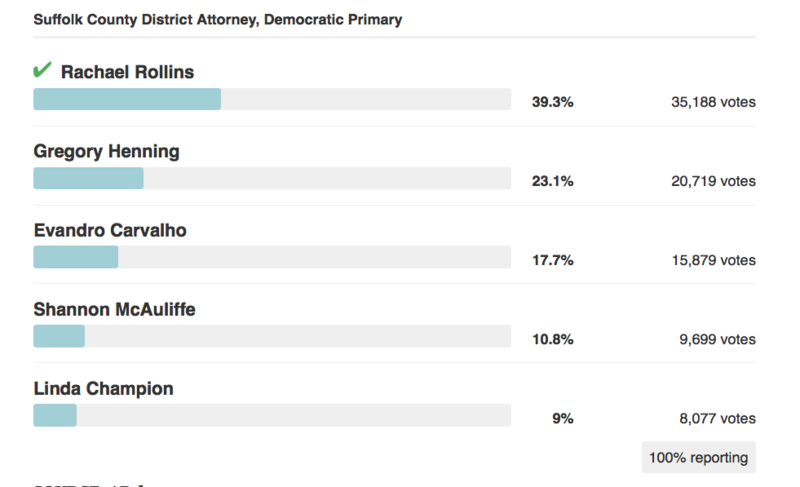 We had feared a similar result in the Suffolk County DA race, where four progressives faced conservative Greg Henning. There were Henning signs all over my neighborhood, and polls showed him way ahead. It was clear that the four progressives would split the vote, and Henning would win with far less than a majority.